The 57th Wing is proud to recognize the outstanding work and dedication of the wing’s top performers during the annual awards ceremony on Jan. 20, 2017. 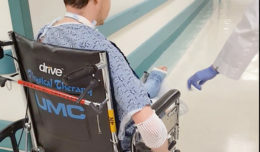 The ceremony will be hosted by Brigadier General Jeannie Leavitt, commander of the 57th Wing, and will be located at the Aliante Hotel and Casino Ballroom. 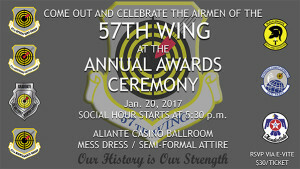 This event will focus on the amazing accomplishments and achievements of the 57th Wing’s Airmen and civilians. All nominees have been recognized by their respective units for their superior leadership, job performance, community involvement, and personal excellence. RSVPs will be through e-vite and tickets distributed through assigned Squadron representatives. The cost is $30 for each ticket and the attire is mess dress or semi-formal. 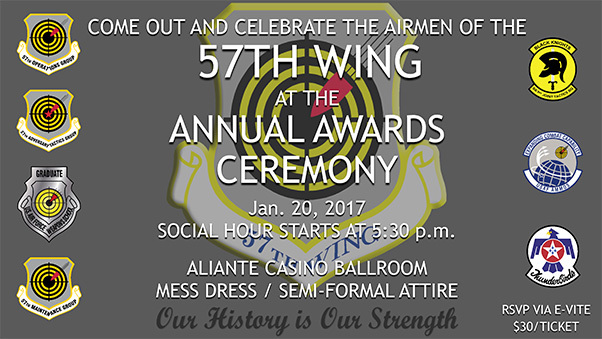 Social hour begins at 5:30 p.m. and the ceremony begins at 6:30 p.m.
Additional information is available on the Nellis AFB home page.